… The old people came literally to love the soil and they sat or reclined on the ground with a feeling of being close to a mothering power. It was good for the skin to touch the Earth and the old people liked to remove their moccasins and walk with bare feet on the sacred Earth … It was the final abiding place of all things that lived and grew. The soil was soothing, strengthening, cleansing, and healing. It’s really hard to screw up compost. That’s what I like about it. 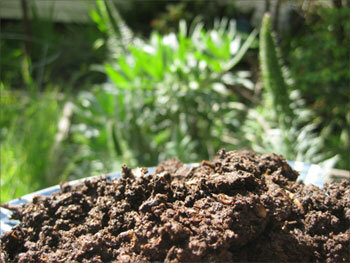 If I do nothing, my compost pile will eventually turn to beautiful, sweet-smelling compost. However, the process can seem to take forever if you don’t pay attention to some of the basics. Once your pile gets out of balance, it can be much more work to get it back on the road to rotting pleasantly. There are four elements to consider for a successful compost pile: Air, Water, “greens” and “browns”. Browns are drier, carbon-based materials. Dried leaves, straw, dry sticks and wood chips are some examples of browns. There should be a good mix of both types of materials in your pile. I have a decomposing bale of straw in my yard, and try to put a handful on the pile after dumping food scraps, but I don’t always remember. The pile forgives me. The most common mistake that is made in beginning composting is to have a compost pile that’s almost all food scraps, or just too many greens in the pile in general. That’s when it becomes stinky, and you don’t want to lift the lid if there are any neighbors around. The remedy to this is to add browns and let it dry out a bit. If you are proactive about adding them as you add your food scraps, you shouldn’t have this problem. You need to chose what kind of enclosure you want to use for your compost, if you do indeed want to use an enclosure. Most of my experience has been with enclosed piles. I will be posting on some different types of enclosures soon. Feel free to comment with your favorite type of enclosure, what’s working for you with a minimum of fuss. You also need to decide where to situate your pile. If you’re in a place that gets very dry, you want to keep it in the shade, so it doesn’t get too dry. You also might want to pay attention to any trees that are growing near your pile, you will be feeding them and they may just get huge! My compost bin is next to some giant Yucca plants, which grow incredibly fast every year. Some people move their compost bins, sitting them on top of a future bed that they want to plant in. A kindred soul, you are. Simply letting compost be is the way. Any day now, I’ll be harvesting some of that black gold. Love your site.